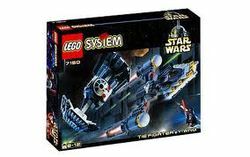 7150 TIE Fighter & Y-Wing is a LEGO Star Wars set that was released in 1999 as part of the LEGO Classic Star Wars line. The box itself contains a TIE Advanced ship and a Y-Wing. 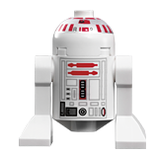 Also included are Darth Vader, Dutch Vander, and a red Astromech Droid minifigures. This is a description taken from LEGO.com. Please do not modify it. It's a battle between good and evil! Take to the skies with the two most popular ships of the Rebel and Imperial forces. The Y-Wing fighter bomber, armed with two turning ion cannons and forward-mounted laser cannons, it's flown by a brave Rebel pilot and droid navigator. Darth Vader, with his lightsaber in hand, is in the control pod of his TIE fighter (which stands for Twin Ion Engine). When they meet in the skies, you decide who wins! Facts about "7150 TIE Fighter & Y-Wing"
It's a battle between good and evil! Take to the skies with the two most popular ships of the Rebel and Imperial forces. The Y-Wing fighter bomber, armed with two turning ion cannons and forward-mounted laser cannons, it's flown by a brave Rebel pilot and droid navigator. Darth Vader, with his lightsaber in hand, is in the control pod of his TIE fighter (which stands for Twin Ion Engine). When they meet in the skies, you decide who wins! This page was last edited on 17 April 2015, at 02:58.